The current obesity epidemic in the U.S. is associated with major medical and social problems accompanied by increased morbidity and mortality, which is proportional to the degree of excess weight.1 In “Bariatric/Metabolic Surgery for the Radiologist: Clinical Insight, Normal Post-Operative Imaging and Imaging of Complications. Part 1 - Gastric Restrictive Surgery,” the body mass index (BMI), the BMI obesity scale, and the indications for bariatric procedures were reviewed. Bariatric procedures are classified as restrictive, malabsorptive or a combination of both. Laparoscopic adjustable gastric banding and laparoscopic sleeve gastrectomy are purely restrictive procedures, which rely on decreased food intake and dietary modification for weight loss. Laparoscopic Roux-en-Y gastric bypass (LRYGB), presently the most commonly performed bariatric operation in the U.S., combines gastric restriction and malabsorption to achieve weight loss, by creating a small gastric pouch and a jejuno-jenunal bypass. 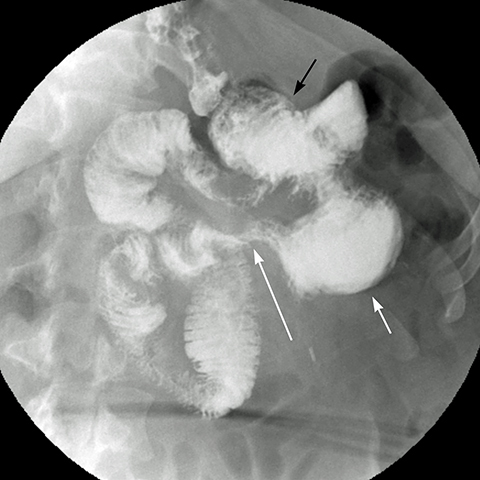 Bilio-pancreatic diversion with duodenal switch, another type of bypass, is technically more challenging and commonly reserved for the super obese patient with BMI > 55 or for revision of failed bariatric procedures. LRYGB can result in control of diabetes and hypertension within weeks of surgery. This article highlights and reviews the clinical and radiological features of normal LRYGB; in addition, it reviews the radiologic appearances of complications, which are summarized in Table 1. With LRYGB, a small fundal pouch with a 15-30 ml capacity is created by dividing the stomach from the lesser curvature in a cephalad direction using a linear stapler-cutter device. The jejunum is divided 25 to 100 cm from the ligament of Treitz. 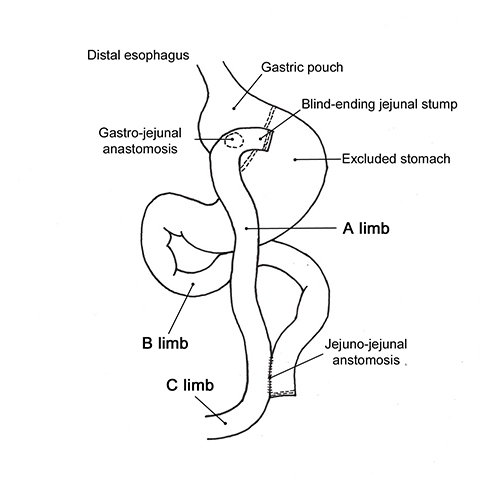 The distal limb [Roux limb or alimentary (A) limb] is mobilized superiorly, either anterior or posterior to the transverse colon, for a gastro-jejunal (GJ) anastomosis. For the posterior approach, a small window is created in the transverse mesocolon. The gastro-jejunostomy is usually an end-to-side anastomosis, resulting in a blind jejunal stump, with a small stomal diameter ranging from 8 to 12 mm to provide gastric restriction. The proximal limb of jejunum [biliopancreatic (B) limb] is anastomosed, usually in side-to-side fashion with a linear stapler-cutter device, to the small bowel 75 to 150 cm from the GJ anastomosis, leading to a common (C) limb that continues into the ileum (Figure 1).2,3 The length of bypassed bowel is determined by the degree of malabsorption desired. 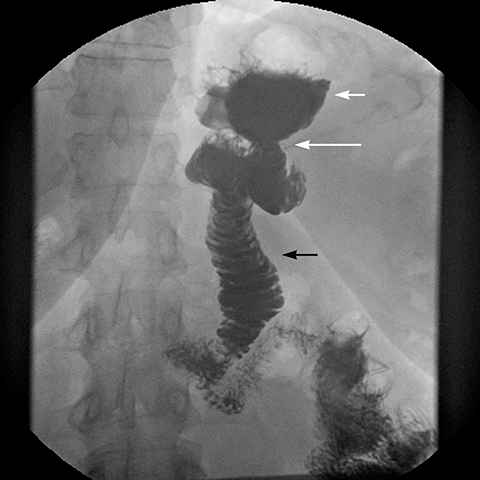 A gastro-gastric fistula is differentiated from an extraluminal leak by observing progression of the barium from the pouch directly into the excluded stomach (Figure 4). 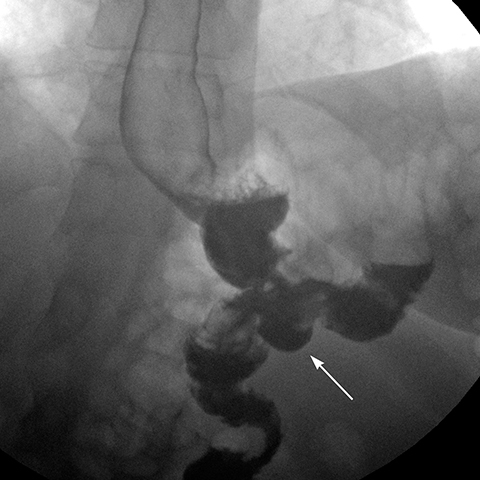 Gastro-gastric fistula occurs in up to 3.5% of patients.13 Early fistulae are associated with extraluminal leak in 90% of patients and may heal spontaneously. 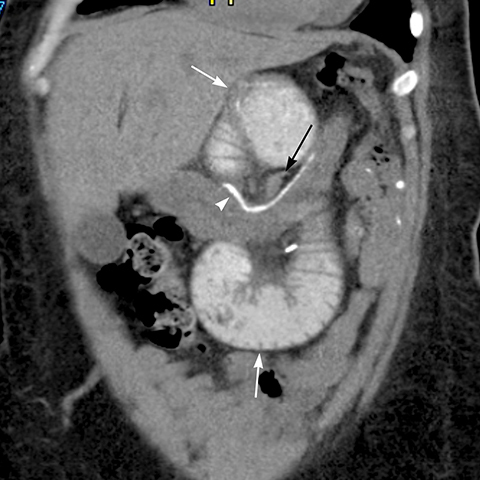 Upper GI series better demonstrates a fistula with the excluded stomach because contrast is followed in real time.2 On CT scan the excluded stomach is normally collapsed, but it may contain a combination of air, fluid and oral contrast, which may have refluxed from the jejuno-junostomy into the B-limb.14 Gastro-gastric fistula is suspected on CT scan when contrast is seen in the excluded stomach, but not in the B-limb. Late gastro-gastric fistulae are associated with flattening of the weight loss curve or weight gain and present with loss of early sensation of satiety, often requiring surgical revision.13, 14 Repeated pouch over-distention may be a predisposing factor.14 Weight gain may also be due to dietary indiscretion with widening of the GJ anastomosis. Hemorrhage after LRYGB occurs in 0.6 to 4% 8,15 usually at the gastric staple line or GJ anastomosis. 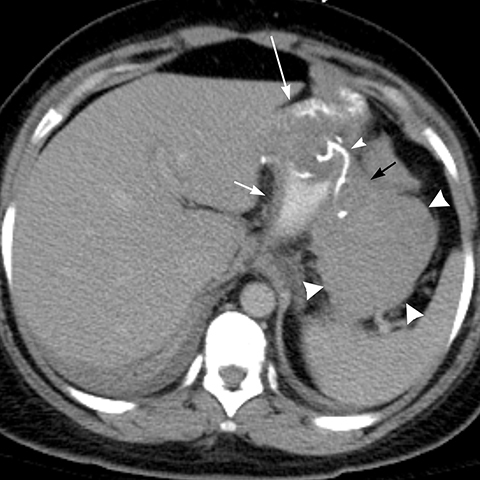 Intraluminal hemorrhage presents with upper GI bleeding and is usually diagnosed and treated with upper endoscopy whereas intra-abdominal hemorrhage presents with a drop in hematocrit without upper GI bleeding.2 Extraluminal hemorrhage is usually self-limited, managed conservatively and diagnosed with CT scan (Figure 5). Continued bleeding and hemodynamic compromise may require an intervention. 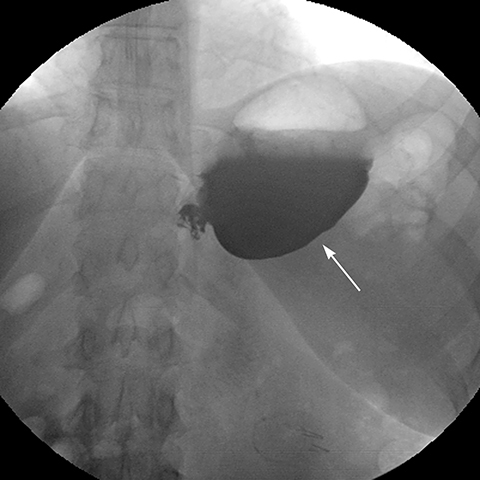 Marginal ulcers at the gastrojejunostomy occur in 3 to 16% of cases.17,18 Ulcers are often solitary, variable in size, and present with epigastric pain and GI bleeding. Possible etiologies include excessive acid production, tobacco and NSAIDs use, suture material irritation, and surgical issues such as the configuration of the pouch, or tension and ischemia of the A-limb.17 Bleeding ulcers are frequently diagnosed and treated with upper endoscopy.2 When visible on the upper GI study, the ulcer crater appears as an outpouching at the GJ anastomosis or abutting the A-limb (Figure 8).4 Ulcers are treated with proton pump inhibitors or with surgery if medical therapy fails. 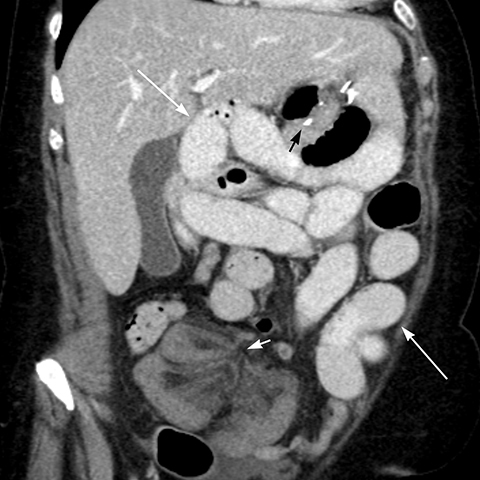 Internal hernias following LRYGB are reported in 1.6 to 5% of patients and occur at the: (a) transverse mesocolon defect (Figure 10), (b) between the mesenteric leaflets at the JJ anastomosis (mesenteric hernia) (Figure 11, or (c) at Peterson’s space behind the A-limb between the transverse mesocolon and the A-limb mesentery.2 Rapid weight loss with decreased intra-abdominal fat and enlargement of the mesenteric defects can predispose to internal hernias.6,20 Internal hernias may be asymptomatic or cause closed loop obstruction, which has a higher propensity of ischemia, infarction and perforation of the strangulated loop. The diagnosis of internal hernia may be challenging when bowel obstruction or dilatation is absent or intermittent.11,20 Symptoms of internal hernias include acute or chronic abdominal pain and vomiting. Pain out of proportion to the physical findings suggests the presence of ischemia. 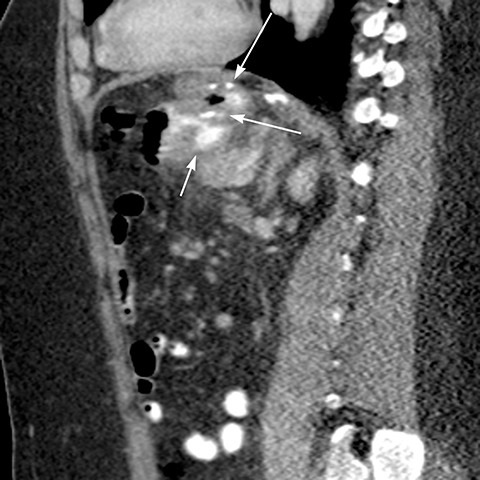 Differentiation of SBO due to adhesions from an internal hernia may be difficult due to overlapping imaging features on CT scan. 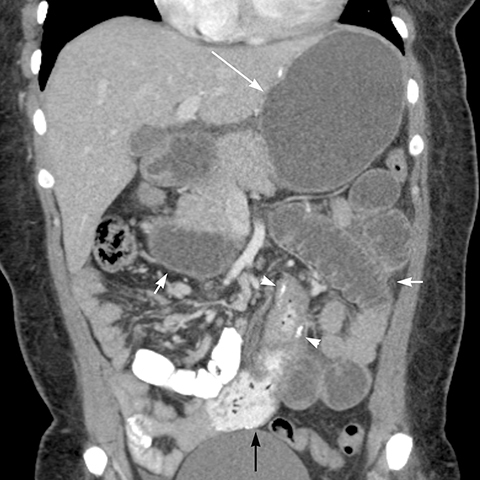 Findings of internal hernia on CT scan are: small bowel loops clustered in the left upper quadrant, or in other abdominal locations (Figure 12), JJ suture line displaced to the left upper quadrant or right mid abdomen (normally located in the left mid abdomen), closed-loop obstruction pattern with two small bowel transition points adjacent to each other (Figure 11), stretching and swirling mesenteric vessels with vascular engorgement, ascending course of tightly clustered small bowel mesenteric vessels and dilatation of the A-limb (Figure 10).4,20 Internal hernia findings on SB series include: small bowel clustered in the left upper quadrant, mid abdomen, and less commonly in other sites, displacement of bowel and suture line, visualization of loops of bowel entering and exiting the clustered segment (Figure 13), and small bowel dilatation in case of associated obstruction.21 There should be a high index of suspicion for an internal hernia in any post-gastric bypass patient presenting with abdominal pain due to the potential for ischemic bowel, which is associated with high morbidity and mortality. Intussusception usually occurs at the JJ anastomosis, which can act as a lead point, with altered bowel mobility as a contributing factor. 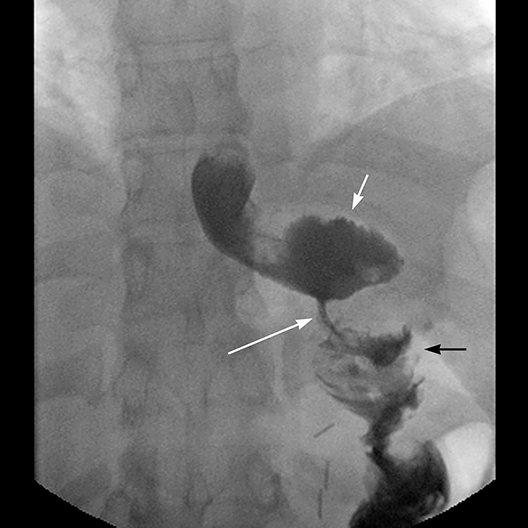 Intussusception most commonly is transient and non-obstructing; occasionally persistent and large intussusceptions cause small bowel obstruction (Figure 14). Food stasis and bezoars in a patulous JJ anastomosis can lead to blind pouch syndrome with bacterial overgrowth and malabsorption (Figure 15). Bezoars can also form in the gastric pouch. Bariatric procedures are being increasingly performed to treat the growing population of obese Americans. This article highlights the procedure-specific complications of LRYGB, which are summarized in Table 1. Knowledge of the normal post-operative appearance of RYGB and imaging of its complications are indispensible for timely diagnosis and efficient patient management. Merkle EM, Hallowell PT, Crouse C, et al. Roux-en-Y Gastric bypass for clinically severe obesity: normal appearance and spectrum of complications at imaging. Radiology. 2005; 234(3):674-683. Herron D, Roohipour R. Complications of Roux-en-Y gastric bypass and sleeve gastrectomy. Abdom Imaging. 2012; 37(5):712-718. Scheirey CD, Scholz FJ, Shah PC, et al. Radiology of the laparoscopic Roux-en-Y gastric bypass procedure: conceptualization and precise interpretation of results. RadioGraphics. 2006; 26(5):1355-71. Levine MS, Carucci LR. Imaging of bariatric surgery: normal anatomy and postoperative complications. Radiology. 2014; 270(2):327-341. Smith TR, White AP. 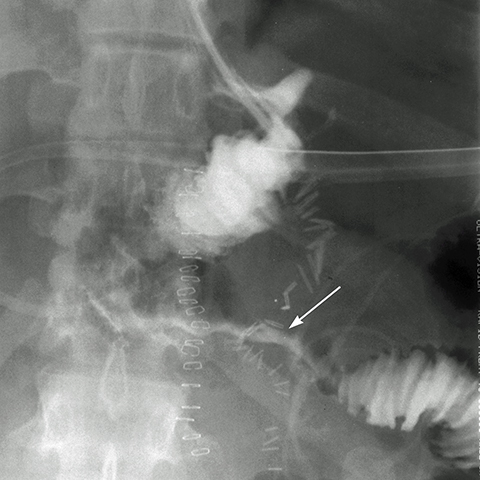 Narrowing of the proximal jejunal limbs at their passage through the transverse mesocolon: A potential pitfall of laparoscopic Roux-en-Y gastric bypass. AJR Am J Roentgenol. 2004; 183(1):141-143. Blachar A, Federle MP, Pealer KM, et al. Gastrointestinal complications of laparoscopic Roux-en-Y gastric bypass surgery: clinical and imaging findings. Radiology. 2002; 223(3):625-632. Himpens J, Dapri G, Cadière GB. A prospective randomized study between laparoscopic gastric banding and laparoscopic isolated sleeve gastrectomy: results after 1 and 3 years. Obes Surg. 2006; 16(11):1450-1456. Podnos YD, Jimenez JC, Wilson SE, et al. Complications after laparoscopic gastric bypass: A review of 3464 cases. Arch Surg. 2003; 138(9):957-961. Ballesta C, Berindoague R, Cabrera M, et al. Management of anastomotic leaks after laparoscopic Roux-en-Y gastric bypass” Obes Surg. 2008; 18(6):623-630. Gonzalez R, Sarr MG, Smith CD, et al. Diagnosis and contemporary management of anastomotic leaks after gastric bypass for obesity. J Am Coll Surg. 2007; 204(1):47-55. Carucci LR, Turner MA, Conklin RC, et al. Roux-en-Y gastric bypass surgery for morbid obesity: evaluation of postoperative extraluminal leaks with upper gastrointestinal series. Radiology. 2006; 238:119-127. ASMBS Clinical Issues Committee. ASMBS guideline on the prevention and detection of gastrointestinal leak after gastric bypass including the role of imaging and surgical exploration. Surg Obes Relat Dis. 2009; 5(3):293-296. Carucci LR, Conklin RC, Turner MA. Roux-en-Y gastric bypass surgery for morbid obesity: evaluation of leak into excluded stomach with upper gastrointestinal examination. Radiology. 2008; 248(2):504-510. Yu J, Turner MA, Cho SR, et al. 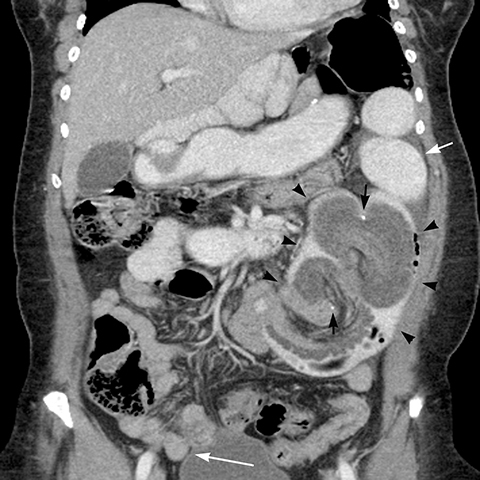 Normal anatomy and complications after gastric bypass surgery: helical CT findings. Radiology. 2004; 231(3):753-760. Bakhos C, Alkhoury F, Kyriakides T, et al. Early postoperative hemorrhage after open and laparoscopic Roux-En-Y gastric bypass. Obes Surg. 2009; 19(2):153-157. Ahmad J, Martin J, Ikramuddin S, et al. Endoscopic balloon dilatation of gastroenteric anastomotic stricture after laparoscopic gastric bypass. Endoscopy. 2003; 35(9):725-728. Dallal RM, Bailey LA. Ulcer disease after gastric bypass surgery. Surg Obes Relat Dis. 2006; 2(4):455-459. Rasmussen JJ, Fuller W, Ali MR. Marginal ulceration after laparoscopic gastric bypass: an analysis of predisposing actors in 260 patients. Surg Endosc. 2007; 21(7):1090-1094. Husain S, Ahmed AR, Johnson J, et al. 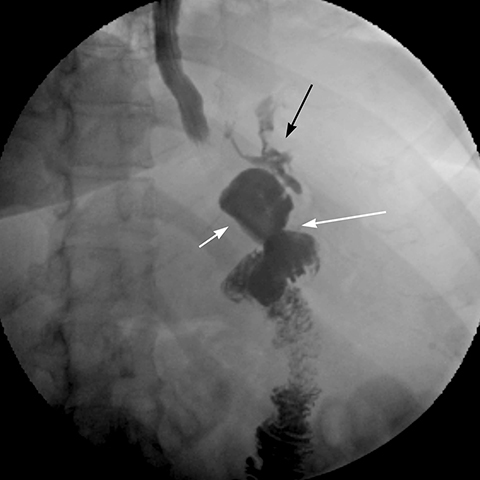 Small-bowel obstruction after laparoscopic Roux-en-Y gastric bypass: etiology, diagnosis, and management. Arch Surg. 2007; 142(10):988-993. Reddy SA, Yang C, Mcginnis LA, et al. 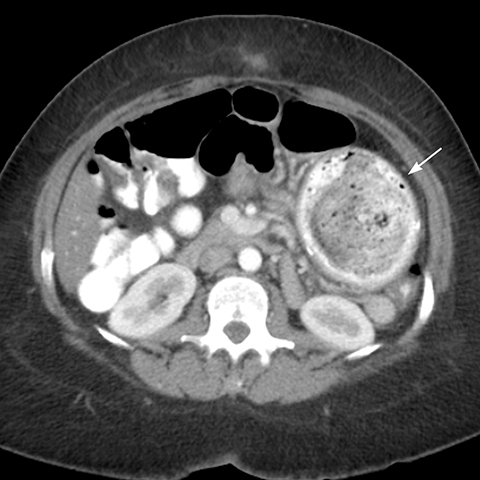 Diagnosis of transmesocolic internal hernia as a complication of retrocolic gastric bypass: CT imaging criteria. AJR Am J Roentgenol. 2007; 189(1):52-55. Carucci LR, Turner MA, Shaylor SD. Internal hernia following Roux-en-Y gastric bypass surgery for morbid obesity: evaluation of radiographic findings at small-bowel examination. Radiology. 2009; 251(3):762-770. Mazzariol FS, Wolf EL. 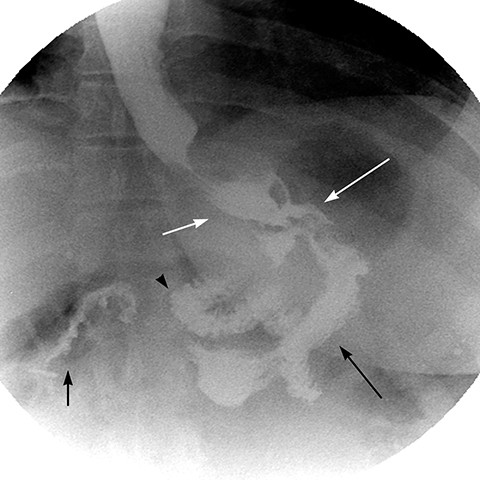 Bariatric/Metabolic surgery for the radiologist—Part 2: Laparoscopic Roux-en-Y gastric bypass. Appl Radiol. 2016;45(12):7-15. Dr. Mazzariol and Dr. Wolf are radiologists at Montefiore Medical Center, Albert Einstein College of Medicine, New York, NY. 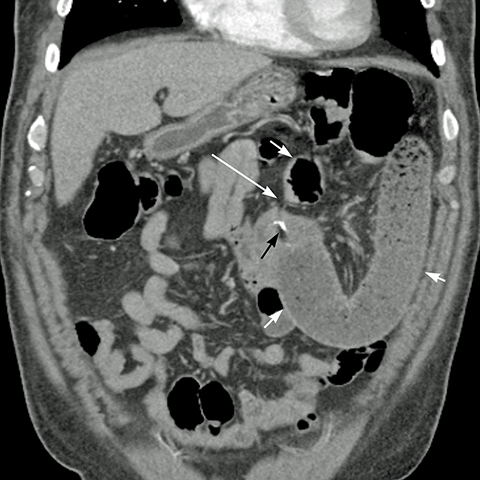 Parts of this material have been used in RSNA Educational Exhibit LL-GIE-WE9B, “Complication of Bariatric Surgery – Review of CT Findings with Fluoroscopic Correlation.” Dec 4, 2013, Chicago, IL. Parts of this material have been used in “Imaging of Obesity Surgery” – oral presentation by Ellen L Wolf, SAR Annual Scientific Meeting and Educational Course, March 2014, Boca Raton, FL.